The latest to do so is San Diego-based MusicMatch. The company on Tuesday launched a revamped version of its digital music service with a new feature that enables subscribers to send e-mails embedded with Internet links for songs they want to share. Like Napster 2.0 and other licensed digital music purveyors who have rolled out similar options, the MusicMatch sharing feature comes with restrictions nowhere to be found in the peer-to-peer file-sharing bazaars accessed through software like Kazaa and eDonkey. The recording industry has traditionally been skittish about allowing its content to be disseminated by anyone but licensed distributors, but they have clearly warmed up to the concept when assured the music would be shared securely, said Bob Ohlweiler, MusicMatch's senior vice president of business development. "Record companies like the fact that people can tell their friends and acquaintances about music," Ohlweiler said. "What the labels don't like about peer-to-peer is that it's free." MusicMatch's overhaul brings it in line with other services that offer streaming permanent song and album downloads and subscription access to streaming music. Like Napster 2.0, MusicMatch subscribers can share playlists with fellow subscribers and others who don't subscribe to the service. Unlike Napster, which only allows nonsubscribers to listen to 30-second song snippets, MusicMatch allows songs to be played three times before the songs lock. Then only 30-second cuts can be heard. The limited sharing feature may help MusicMatch vie for market share with rivals for the digital music dollar, particularly Napster 2.0, Rhapsody and Apple Computer Inc.'s iTunes Music Store, which doesn't offer a sharing feature. "It will be an incremental feature that could lead them to be more competitive," said Phil Leigh, an analyst with Inside Digital Media. "You'll probably see other people follow MusicMatch's lead, particularly if it proves successful, and my guess is that it will be." Whether such sharing features in licensed services will motivate P2P file-sharers to switch, is anybody's guess. Despite growing numbers of users for the licensed music services, millions continue to download music, movies and software over P2P networks. 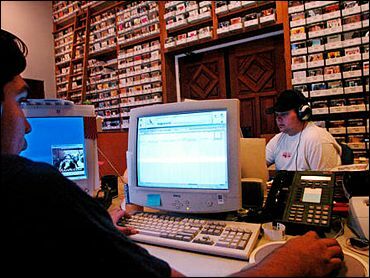 Experts differ on whether the more than 3,000 copyright lawsuits brought by record companies against individual computer users have had an impact. Ohlweiler said the idea behind allowing users to share music was not about mimicking the unfettered exchange of files that occurs on P2P networks. Other digital music companies, however, have embraced P2P, directly distributing files over the networks. One example is Altnet, a partner of the company behind Kazaa. It has been promoting the sharing of licensed content over P2P. The files often come with some restrictions, such as the number of times songs can be played. Another service is Mercora, which uses P2P networks to allow users to listen to each others' music, as Web radio stations do. No files are actually exchanged, so Mercora has avoided the sort of legal scrutiny that the recording industry has brought to bear against others. Recording artists have also turned to file-sharing to distribute and promote their work. Earlier this month, 1980s glam-metal rockers Heart released its new record, "Jupiters Darling," in a computer file format that enables computer users to share the song file online. Anyone who opens the file gets to hear the songs three times and then the files lock up until the computer user pays to unlock it. In June, Steve Winwood openly made the song, "Dear Mr. Fantasy," available for sharing. Since it was released, more than 40,000 computer users on P2P networks have shared the song, according to BigChampagne LLC, a Beverly Hills-based research firm that tracks P2P traffic. No numbers were immediately available for the Heart album.